(Bloomberg) -- Joe Biden twice joked about asking for permission to hug people during his first appearance since the emergence of complaints from women about how he touched them, then said later he was sorry for not understanding the effect of his actions. In a speech to the International Brotherhood of Electrical Workers Friday in Washington, the former vice president made only a glancing reference to disclosures by several women who’ve expressed their discomfort with Biden’s style of physical contact with people he meets. Biden is moving toward announcing a presidential campaign and is positioning himself as the Democrat with the best chance to win back many of the middle-class voters who flocked to President Donald Trump in 2016. But he’s been grappling with how to respond the complaints and questions from some Democrats about whether his touch-intensive political style makes him the wrong candidate for the #MeToo era and for a party reliant on female voters angry about Trump. Speaking to reporters afterward, Biden said the jokes were not an attempt to make light of the experiences of the women who’ve accused him of acting inappropriately. It was “never my intention’’ to make anyone uncomfortable, Biden said, adding that he “wouldn’t be surprised’’ if other women were to make similar complaints. While his comments Friday drew laughter and cheers from a blue-collar crowd made up predominantly of older white men, they attracted criticism from Democratic women who heard it as tone deaf. “WHO IS ADVISING BIDEN THIS IS CRAZY,” Zerlina Maxwell, a former Hillary Clinton communications adviser, wrote on Twitter. The bulk of his speech was a tribute to hourly workers and a lament that corporations no longer feel responsibility to employees. Biden, 76, has led in early polls of primary voters and could capture significant support from major Democratic donors, many of whom have held off from backing other candidates while awaiting his decision. The controversy over his hugs and touches doesn’t appear to be derailing his plans to enter the race in the coming weeks. “I am very close to making the decision to stand before you all very soon,” Biden said. The accusations emerged in the past week, after former Nevada assemblywoman Lucy Flores wrote about her uncomfortable interaction with the former vice president in a New York magazine column published last Friday. None of the women have said that they felt Biden’s actions were a form of sexual assault or harassment. Biden and his spokesman initially responded with written statements before releasing a two-minute web video on Wednesday in which he promised change but did not apologize to anyone who he’d made feel uncomfortable. 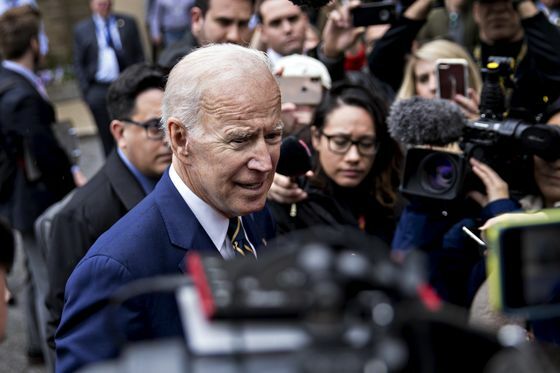 Other Democrats, including those already running for president, haven’t called on Biden to reconsider his expected entry into the race, but several have said his statements that he never intended anything untoward aren’t enough. Trump has taken jabs at Biden despite his own history of accusations of sexual misconduct. He retweeted a doctored version of the video Biden released on Wednesday addressing the complaints. In the altered version, while Biden is speaking a cartoon-like version of the former vice president appears behind him to caress his shoulder and nuzzle the back of his head. It indicates that Trump’s history won’t restrain him from hammering Biden on the issue should he emerge as the Democratic nominee. Speaking to reporters as he left the White House Friday for an event on the border with Mexico, Trump said he doesn’t view Biden as a political threat.